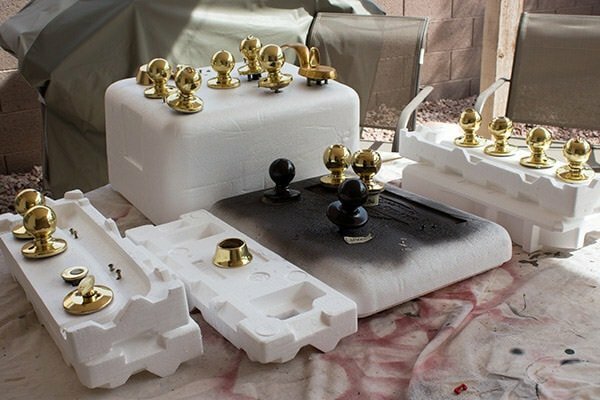 DIY Spray Paint Door Knob Makeover is the quickest and easiest way to revamp your old ugly door knobs for cheap! 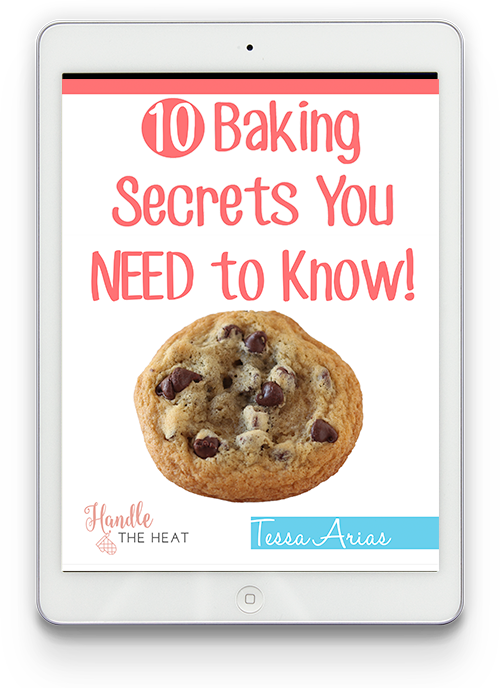 Today’s Sunday Funday post isn’t a food recipe, it’s a recipe for a DIY home makeover that makes a surprisingly noticeable difference in your home. A few weeks ago I was surfing Pinterest and came across a before-and-after picture someone had taken to show how spray paint can makeover your door knobs. I was amazed, but also skeptical. How many “Pinterest fails” have emerged across the internet that show how far-fetched some of these DIY projects can be?! But this particular project is pretty easy to test and if it completely fails one screwed up doorknob isn’t a big deal. 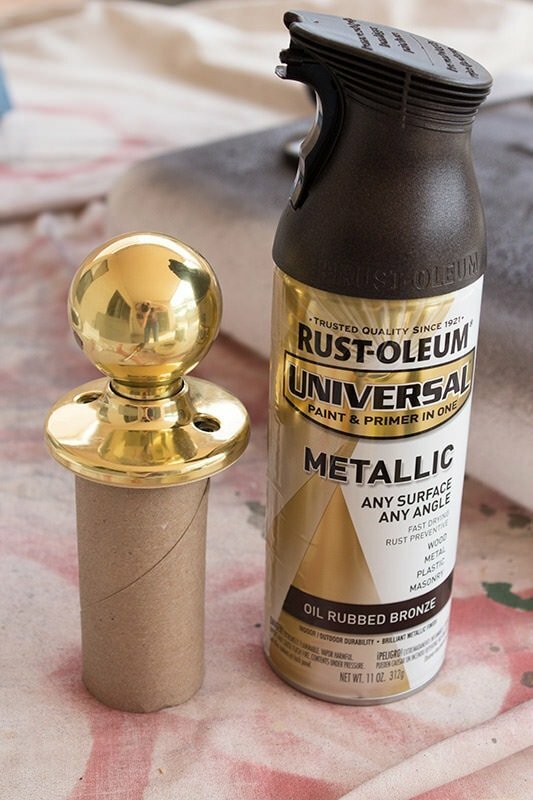 So on a random trip to the hardware store I felt inspired and decided to pick up a can of Rust-Oleum Oil-Rubbed Bronze Metallic Spray Paint to test out this DIY project on a linen closet door knob that doesn’t really matter much. All we did was remove the door knob with a screwdriver, wipe it down with a Clorox wipe, and take it outside to spray paint. I was astounded by how great it looks. That spray paint is pretty miraculous, I seriously don’t know how they get those little opalescent glittery specks in there and make it look so multidimensional. We immediately got to work on the rest of the door knobs in our house, even our big front door one, and set up a little station outside on a drop cloth covered patio table. We used empty toilet paper rolls and Styrofoam to prop up the door knobs so it would be easier to spray and dry. I also labeled each knob with scotch tape and wrapped it around the spindle so we wouldn’t confuse the knobs since some of them had small differences. We also sprayed the screws and covered any keyholes with small circular pieces of tape to maintain the lock’s functioning. It ended up taking two coats, after the first coat dried we saw some areas around the bottom of the knobs that we had missed. All in all it was a super simple afternoon project that cost about $10, less than the cost of ONE door knob! It immediately upgraded the more 1990s elements of our house into the 21st century. See how pretty?! Obviously it doesn’t look quite as glittery inside the house and out of the sunlight. The color and sheen are perfect inside. Many of our door knobs were beat up, scratched, and some even had chunks of gold finish rubbed off. The spray paint does an excellent job of masking all of that. I’m going to do this to all my knobs!! Thanks for sharing!!! Wow! Your door knobs look great! Yes! I’ve been wanting to do this, but wanted to see if someone else has had success with it, glad to see it worked! Happy to know I’m not the only one who might have experienced a Pinterest DIY Fail, especially when spending a ton of time and money! I’m always a fan of easy and quick updates, did you have any trouble with sticking on any of the hardware? I see that several knobs were painted black. You didn’t mention a base or primer coat. I’m sure it makes a difference. What was your experience without the base coat, if any? The only color I used is the Rust-Oleum Oil-Rubbed Bronze Metallic Spray Paint as photographed in the post, it’s actually a primer and paint in one. My experience is as written. I’ve had friends do this successfully and I’ve thought about it. I wonder about the wear and tear, but I figure you can just touch up. What did you do about your hinges? That’s what I figured. Plus our knobs were already heavily worn so anything would be an upgrade! Our hinges were actually already painted the same white as the doors so no paint needed there luckily. Thanks! Nope, no problems at all! They work exactly the same as they did before. As you can see in the photos we pierced the knob spindles through styrofoam so that the only thing coated in paint was the knob itself, no actual twisting/locking mechanisms. I’ve used the Rustoleum also on newer hardware as well as the 70 yr old hardware on the house we just bought. Works well, but I primed mine with a light coat of Kilz primer first. I like the Aged Iron Rustoleum the best though if you have black iron accents in your home. I also painted my light fixtures, towel bars, tissue holder, etc. Both are good and there’s also a hammered black & silver. The best way in the world to improve hardware for the price of spray paint. Do you think this can be done with the knob still attached to the door? No I wouldn’t recommend that. Taping off the area around the knob would likely be as much work as removing the knobs, plus you wouldn’t want to risk getting spray paint on your door, wall, floor, etc. Also, spray painting all your knobs indoors isn’t a good idea. You don’t want those harmful vapors in your house. How are they holding up after some time? Just wondering how often retouching would be needed? These look awesome, and this could be a great solution for the tacky and worn gold doorknobs in the house we’re buying! My only concern is the paint causing the button locks on the doorknobs to stick – have you had any issues with that? We haven’t had a single issue in that regard, and I was a little concerned about that. Just make sure to do apply the spraypaint in thin, sweeping motions so it won’t glob up anywhere. It might vary depending on the type of doorknobs you have, though, so you may want to test it out completely on one knob before doing the rest. Fantastic result by the looks of it, but I’m concerned that overtime the finish will ware off or perhaps chip? I may try this though rather than buying new handles but how is the finish now after five months of use? I’ve been meaning to do a follow-up. Right now the only knob with any real wear is the garage door knob which we use to come and go from the house. I accidentally jammed a car key against the knob and it scratched the paint off. I think it would have damaged any doorknob but it’s pretty obvious on this one with the gold underneath. Other than the the paint has held up wonderfully! Looks fabulous! I am highly considering doing this to all of the knobs in my house as well. My concern is how to clean them. 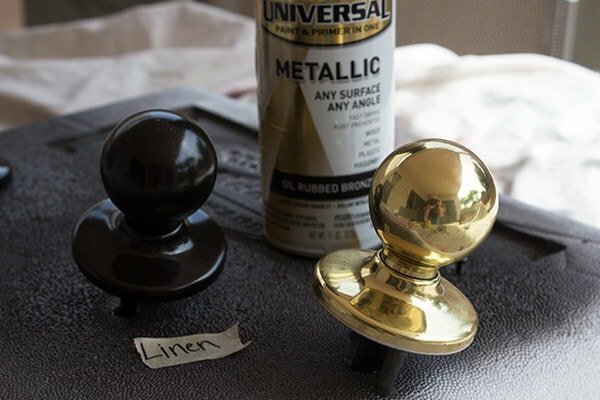 Right now, I take a Clorox wipe to all of my silver/brass knobs to simply wipe the germs off; however could Clorox wipes still be used to clean the Rust-Oleum Oil-Rubbed Bronze Metallic Spray Paint? How have you cleaned your knobs? I haven’t had any issues with being able to wipe them down! I sprayed mine last weekend and my pantry door knob is sticky. I thought it was food and wiped it off, off came chunks of paint! Now I’m noticing other doors feeling kind of sticky. Solution? Also, the little click/latch thing on the door that hooks into the hole in the wall are all rubbing off since they get scraped every time you open the door. It’s so frustrating!! Hi Amanda – ours weren’t sticky at all. Could you have sprayed too heavy of a coat? Or maybe they were never able to dry completely (is it really humid where you live? )… I can’t say for sure. As for the “click/latch” I think I know what you’re referring to and if you notice in the pictures in this post, we didn’t actually spray that part of our knobs. Since they aren’t really visible unless you look at the side of the door directly when it’s opened, it didn’t seem worthwhile to spray that part which would likely rub off. I did this project to all the door knobs in my house and slowly but surely the knobs are turning sticky and the paint is coming off. I did this last summer so it has almost been a year however the garage door knob came off in a couple months. I sometimes think I sprayed too much paint however I never roughed them up. Do you have any recommendations? I’m very impressed. I have seen similar results recently and may have been the original post that prompted you to do this. I have had several old vintage brass knobs and plates waiting to be polished but I may attempt this instead. I am thinking of repainting a heap of Gold Door knobs, and am wondering now that its more than a year since Tessa did them… how the originals are wearing. I tried it & had a problem with the paint almost turning into a rubberish material….it let came off ? Has anyone else had this problem? Love the idea & want ti to work. I did this exact process with the same paint and everything. 6 months later pretty much all the knobs have some type of chip or scratch and the ones we use more regularly and a mess 🙁 if anyone comes up with an easy way to keep them looking fab. please post! Maybe a few clear coats?? We have painted out knobs upstairs, as well as the hinges, we cleaned them, used 0000 steel wool to prep the surface so the paint would adhere better. For bathroom knobs especially you have to have a good clean surface to paint. All of the hair products, lotions, etc will be on the knobs and must be removed. We love how they look, next weekend we will do the downstairs. Thanks for sharing!! These look great and I have done the same with mine using the exact same brand and color of paint. Some of the knobs have a sticky feeling to them… Did you have that issue? I’m wondering if spraying those with a clear varnish will work. Does anyone have the results for using a clear coat over the spray paint? Thanks! I will do this, but what about all of the gold hinges on each door?? We live in London Ontario and can’t seem to find this paint anywhere, where do you buy it? I tried this on a high use door and found the results just did not last. I loved the look but within weeks the brass was peeking through. I did this! I did my hinges to my doors and the door knobs. They turned out absolutely beautiful!!!!!! Thank you for the idea. I thought about doing this and am glad to know it works well and is in expensive to do! I did this last winter on all the brass handles, strike plates, hinges, bathroom light fixtures, towel bars, toilet paper hikers, knobs, etc. this summer some of the door handles got sticky and started to chip off. My original prep included rubbing with steel wool and fine sand paper then washing with dish soap. I let them dry thoroughly before painting. I think the ones that got sticky were painted with second coat at not ideal time or too thickly. Instructions state apply second coat within 1 hour or wait 48 hours. I redid these few door handles with same prep but made sure second coat applied within hour and not too thick. I then applied a clear coat polyurethane after they dried a couple days. So far so good. All others not redone are still looking good. I still need to do all the outside doors. Have not done the bathroom faucets as considering buying new. I did all my kitchen cabinet handles like this and washed them all in a good grease removing soap w vinegar and even wiped off with alcohol and also sanded them to rough up a bit first. They looked awesome at first but now have the paint coming off of some of them and I used this same rustoleum spray paint with two coats. Was very disappointed because they looked like I went out and bought all new wrought iron handles. I was afraid to do door knobs after this happened. Anyone else had this problem w paint coming off? They were old brass type handles. Don’t think they were real brass just look like it. I have done the same thing with brass bathroom fixtures. I cleaned and sanded the fixtures thoroughly. Did not use primer, but did use a clear coat, same brand. In my case I used a matte clear coat to seal in the paint. I did two coats of both the paint/primer and clear coat. I think the clear coat sealed it well and even if it gets scratched, hopefully the clear coat will be the only thing affected. Actually, I didn’t even take the fixtures off, I just taped off real well. Looks fabulous! My bathroom went from the brassy 80’s to the 21st Century over night. Luckily this was done on our 2nd home, so just before we left I painted, giving them at least 6-8 weeks to dry without touching. Not sure if that makes a difference, but if nothing else, clear coat, clear coat, clear coat. Just like nail polish. I did a test run on a doorknob I had and though it looks great right away, they scratch VERY easily and you’re left with gold or silver lines anywhere that are much more noticeable than scratches in the old knobs. After that fail I tried spraying over it with a polycrylic gloss but still had the same issue. The spray is not meant for areas of heavy use. Brilliant idea to give a new look to old door knobs. I haven’t tried it yet, but I’ll try it soon on my room’s cabinet knobs and I’m sure it will work well. I did our front closet door last week to see how it looks and wears before doing the rest. I chose to do everything – knobs, sticker plate, hinges, etc… for a consistent look. I took advice I saw elsewhere to give it a light buff with 000 steel wool, as others have mentioned. This takes the gloss off, as well as helping remove dirt or oils. Wiped it down with damp paper towel to remove the ensuring dust. This may help those who had peeling. So far, love the look. Will see how they wear. I expect the striker to rub a lot off, but the brass had already done the same anyway. Worst case is I need to redo in a few years, I hope, same cycle as wall painting. For the poster with sticky finish, I se that with spray paint is it is heavy coats instead of many light ones and/or if the temp is too cold. Be careful. I used that exact same paint, same color on my kitchen cabinet handles. I sanded them first and clear coated them afterwards. After a few months the pain started rubbing off. I really like this idea. What a great way to upgrade furniture and doors without spending a fortune. 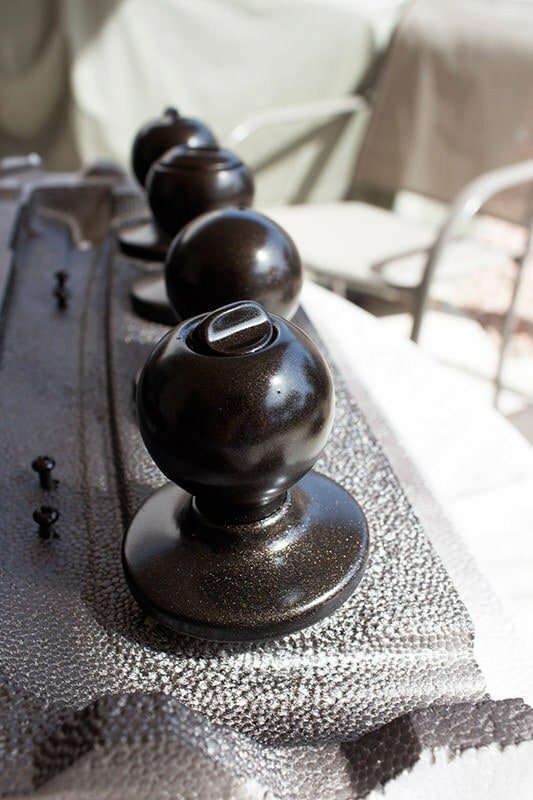 I had black kitchen cabinet knobs in a new construction home, the black started rubbing off after about 16 months. A friend remodeled her home and bought new lever style door knobs, in oil rubbed bronze, but a cheaper brand. Unfortunately the same thing happened to her doorknobs : (. If it happens on new hardware it’s bound to happen on DIY hardware. Before you do this prepare yourself for the fact that there might be touch up needed in the future. The door knobs look absolutely amazing repainted, it’s an idea I’ve tossed around for the past 2 years we’ve lived in this brassy house. Maybe I’ll win some money on a scratch off lottery ticket and I can buy new brushed nickel door knobs and not worry about the color rubbing off, lol! I know that this post is old but maybe I’ll get a response. You said that you painted the screws. Did you paint them scattered on the drop cloth or in place? Also I had another idea about how to protect the key holes by just leaving the key on the hole. I did mine and I found that if you use course sandpaper to lightly sand them the paint sticks to them very well it’s been 3 years no problems..
You guy’s did exactly what we did! Came out BEAUTIFUL!!! BUT…..AND I MEAN BUT…..the paint chips off so easy it’s not even funny!!! It’s just me and my husband, so no kid’s…..buy my husband is VERY clumsy lol…his hands are huge and an example would be “A bull in a China cabinet!!) Anyone know HOW to keep the paint on and not coming o# so quickly???? Good job guy’s, hour’s turned out good except the pain stay on! After reading all the posts, it appears to me that the reason some users are experiencing paint lift off is the surface should be wiped down with wax and grease remover prior to painting. Soap and water will leave an oily residue and will impregnate the metal/base paint. As a body man I know how important a CLEAN surface is! Hope this helps future DIY’ers. Katherine Hunter, I’m sure its way too late, but if you look at her picture of all the parts in styrofoam, you can see the screws in the leftmost piece, standing straight up to get sprayed! Can’t wait to try this. After the makeover, it’s looking nice, and make more beautiful your door. How much time they need for dry. Because once I am applying spray paint on the door and another area then its still quite sticky. I think its happen because of the humidity in the atmosphere. If you have any advice to do this task natural and nonsticky, then give me. Thank you in advance. Ugh, I so wanted this to work. The clear coat makes them look like crackle paint, (I thought maybe they were not dry enough). My husband hated them so I stripped them down, painted them and waited 3 weeks to try to clear coat. Same crackling. They ARE sticky. What a mess. Will probably strip them again and just leave them the ugly gold. I did mine in Nickel..2 coats and finished with a clear satin topcoat. They are holding up very well. No scratches, chips, or dings. To keep them from chipping, its all in the preparation. Light sanding & washing w soapy water won’t do it!!! I used a powder cleaner called BAR KEEPERS FRIEND & medium grade scouring pads.. I scrubbed them to the original finish. Be prepared, its a task!! Then spray a light a coat of primer, covering them completely…Let them dry an hour or so, then follow up w Rustnoleum Spray of your color…Allow them dry at least 24 hours…Once FULLY dried, GENTLY wet sand w 1200 grade sandpaper to smooth the surface..Be careful not to sand too hard bc it will chip. When it feels smooth, spray several LIGHT coats w MATTE clear coat until completely dry (24 hours is best)or you can also put them in oven @ 180 degrees for 2 hours. No absolute guarantees, but they should last a considerable time longer w/out chipping..Good luck folks! !